Spotify for Android was recently updated to version 0.4.04. This update included the new social and local file features found on the desktop and iPhone versions, as well as Last.fm scrobbling and a few other goodies. Here’s a look at the changes. The first main change you notice when starting Spotify for Android is the addition of four new sections at the top of your Playlists. Spotify for Android now has support for playing and wirelessly syncing local music files. Whenever you start the app, Spotify checks your memory card for music files and adds them all to the Local Music section. If you have a lot of mp3s in your phone it may take a while for Spotify to add them all. You can’t disable this option, but fortunately once added Spotify will only check for new files each time you restart it. The local music itself is presented as one huge list of tracks, with songs ordered by track number and album. Unlike on the desktop client, the Search tab here ignores all your local music, so it’s a bit tricky to find what you want. Wireless synching works well. On your desktop, fire up Spotify, select some local files, then create a new playlist. Make sure your Android device is connect via Wi-fi to the same network as your PC, then tick the new playlist as an Offline playlist. The files are then downloaded from your PC into Spotify, ready to listen to on-the-go. The downloaded files can also be played in the stock Android Music Player. You can “star” a track from anywhere a track name is displayed, as well as in the main Play tab. Tap on the main Starred list to view all starred songs together. The Library section is another huge alphabetical list of all your tracks, combining all local music and playlist songs. I don’t really see the point of this, since all the songs are listed in a more convenient way elsewhere. 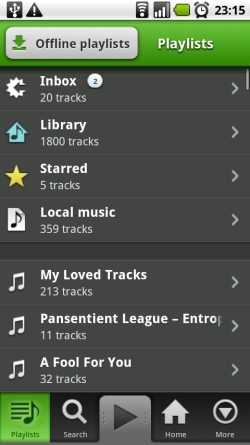 Tracks are listed alphabetically though, so perhaps the Library might be useful to scroll to a particular song. 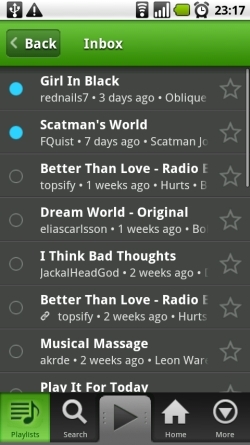 The Inbox is where your friends (and strangers) can put tracks for you to check out. It looks almost the same as the Inbox on the desktop client, although you can’t filter to show only items from people you follow. The blue circle indicates tracks you’ve not yet listened to. The new Feed tab lists tracks and playlists that your friends on Facebook have added (the equivalent of the What’s New > Feed section on the desktop client). The Top Tracks tab lists the most popular tracks on Spotify in your country (it’s the same as What’s New > Top Lists > Tracks in Country on the desktop). This update brings all the new “Spotify: The Next Generation” social and local playback features from the desktop to the Android version of Spotify. The new wireless syncing feature makes copying music from a PC to your phone simple and painless, and the Inbox and Feed sections give the app much-liked social aspect. 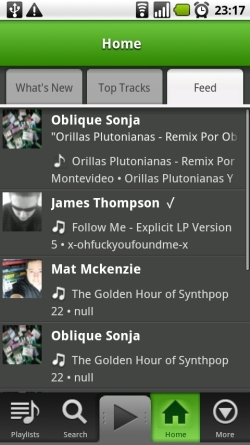 Of all the new features though, it’s the Last.fm scrobbling that I’m most pleased to see. I use my Last.fm profile to drive all sorts of music discovery and have been hoping to see it in Spotify for Android since it was first released. Spotify for Android version 0.4.04 is now almost as current as Spotify for iPhone (now at version 0.4.5). The mobile feature-gap is smaller now but Spotify for Android is still playing catch-up. Spotify said they also added “the ability to filter for tracks in playlists” to this update – I’ve not been able to find this anywhere in the app though, so if anyone knows how to do this please let us know!